A page from William McKay’s “List of Indians trading at Fort Ellice” in Fort Ellice ledger, 1866-1868. HBCA B.63/d/11 fos. 12d-13. Courtesy of Hudson’s Bay Company Archives, Archives of Manitoba. Through a sheer accident of history, a document useful for better understanding environmental change survived the test of time. Just after World War I, a farm boy digging around the ruins of Fort Ellice, in present-day Manitoba, unearthed one of its fur trade account books. The post had burnt to the ground in the 1890s, but the 1866-68 book was miraculously preserved within an airtight and waterproof space in its charcoal timbers. Otherwise a pretty typical fur trade accounting book, with columns tallying furs, provisions and trade goods, the book is extraordinary for the treasure hidden inside: a “character book” written by the chief trader, William McKay, in 1868. By the 1860s, HBC traders regularly kept lists of aboriginal traders and rated their character for credit or trade. But McKay’s book was exceptional. Knowing his aboriginal clientele very well, he accounted for some 97 aboriginal and 28 Métis hunters in a list about 6 pages in length. McKay wrote beside many of the Dakota, Ojibwa, and Cree names his rating: “good,” “a good hunter,” “not to be trusted,” “a good old wife,” “a good hunter but trades little,” “a useless scamp,” and the like (figure 1). Figure 1: A page from William McKay’s “List of Indians trading at Fort Ellice” in Fort Ellice ledger, 1866-1868. HBCA B.63/d/11 fos. 12d-13. Courtesy of Hudson’s Bay Company Archives, Archives of Manitoba. 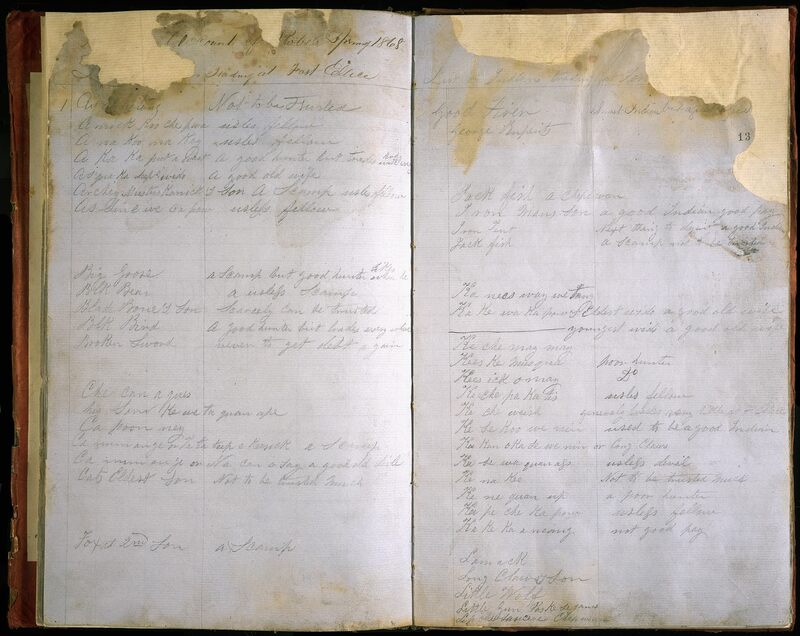 McKay’s character book is valuable as part of a larger study of the bison hunt supporting the pemmican trade in the Canadian West. It helps sort out how aboriginal people were responding to the environmental changes occurring around them. In many parkland areas of modern-day Manitoba, big game had declined in availability. Meanwhile, on the plains, the great bison herds had steadily shrunk westward. By the 1860s, many of the herds were found only in present-day southern Alberta and southwestern portions of Saskatchewan. For that reason, Manitoba Saulteaux and eastern Plains Ojibwa were in difficult straits. Since the 1820s, the HBC had largely controlled the prices of bison products that made up pemmican for its transport needs. Assigning quotas to districts across the prairie, it could purchase from one district if the hunt failed in another, or if aboriginal hunters in one area demanded more for their product. By maintaining, overall, low prices for bison products, the quota system helped mask the effects of overhunting and the bison’s steady depletion for long periods of time. But with prices so low on the market, HBC posts did not just buy for their district quotas, but also for their own stocks on hand. Traders used cheaply purchased pemmican to give as gifts or trade as food to needy hunters, especially those facing difficulty in territories overhunted in big game. At Fort Ellice, the post’s trader tended to purchase cheap pemmican available from the western hunt in order to offer it to Cree or Ojibwa in Manitoba trapping on lands depleted in game. By the 1870s, for instance, the post sent some 3,000 to 4,000 lbs of pemmican to its outpost at Riding Mountain in a single year to support Ojibwa continuing to trap for the company over the winter months. By that time, their forests were largely bereft of moose and other big game animals that could otherwise have supported them. The character book’s value lies in its identification of individual aboriginal people. These individuals can be traced backwards through Fort Ellice’s post journals, where they appeared and reappeared often annually over decades. The book reveals some intriguing relationships between aboriginal people and traders. Individuals given good credit ratings were often those arriving from Manitoba regions steadily depleted of game. In the 1850s and early 1860s, the same individuals could often appear at the post to trade meat, in addition to furs. But over time they appeared only with furs, or only to receive credit in food. By 1868, many of the individuals appearing trustworthy to the company in fact needed the foods it offered. The company could leverage such food credits to see that intensive trapping continued in ever-poorer areas. At the same time, there were many poor credit ratings attached to individuals. Some of these were Ojibwa, Cree and Métis joining large hunting assemblies and travelling long distances to the last bison hunts (figure 2). Returning home with food for their communities, they could also trade surplus pemmican to the post. But, with such demonstrations of independence, McKay was clearly concerned about their reliability. Some of the Cree—such as Good Firer, rated as “Smart Indian but a great liar”—were able to come and go from the distant hunt with vast surpluses of bison products and maintain a lot of independence from the HBC. 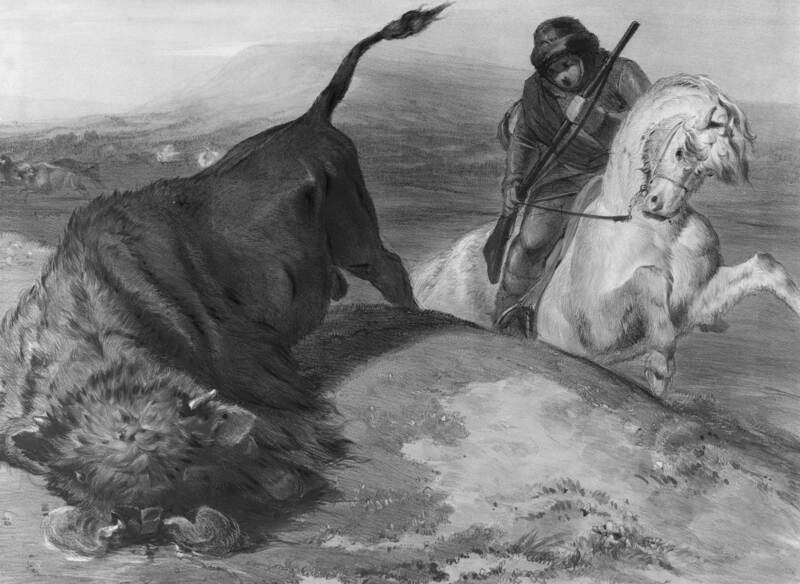 Figure 2: “Buffalo Hunting” (Rebellion of 1837-38) c.1839; Coke Smyth; Lithographed by A. Ducote, London, HBCA P-39. Courtesy of Hudson’s Bay Company Archives, Archives of Manitoba. Examining documents such as this character book suggests some pressing research priorities. More environmental history needs to be based not only on HBC journals, but account ledgers. Pretty dreary reading awaits anyone wading into these tallies of food, furs or work services provided by aboriginal people. But human ecologists have started to work with some of these records, and there is great promise in a comprehensive study of accounts that could reveal changing ecologies and human responses to them in HBC territories. HBC posts also offer a geographically arrayed system of historical environmental listening posts. Their accounts and daily journal records, written from particular locations, are often unbroken over long periods of time. A comprehensive historical GIS study could more accurately suggest the availability of furs, bison products or other country produce within the changing climatic and environmental circumstances of the prairies, parkland, subarctic or mountain cordillera. Historical climatologists have already begun frequency count analysis on specific post journals. Ideally, historical GIS projects, especially those coordinating teams of researchers, could offer new perspectives of regional environmental change based on other indices offered in journals, and, especially, ledger accounts. Finally, Ted Binnema, Gerhard Ens, James Daschuk and others have shown how environmental history complements Native history and makes it more meaningful. National, but also individual, aboriginal histories can be further situated in historical environments and ecologies. While many perspectives are being recovered in oral history research, much can still be revealed of native environmental history in the records, some derived from the very foundations, of HBC posts and its system of journals and account ledgers. There is so much more research to be done with these HBC records. New EH graduate students can find so many thesis and dissertation topic ideas just by reading The Otter, it seems. Thank you very much for sharing this! Apart from the fascinating possibilities in spatial analysis here, I also find the economic / financial angle equally relevant in providing some perspective on credit-driven business and banking in today’s context. What an incredible source, with its own incredible discovery story! Interesting details on food as leverage here too. Seems intelligence and lying weren’t mutually exclusive! For a PhD course I took on the Fur Trade I did a paper based on the ledger for Fort Carlton, SK (where I also worked as a tour guide during undergrad) from 1823-4, and presented on it at CHA 2007. The paper was focused more on the social and material history of the fort and First Nations who traded there, but I remember thinking that these ledgers could be a very revealing source from an environmental history perspective (e.g., they also faithfully recorded the temperatures and season changes, and thus would be great for tracking climate variations). I never followed up because my interests were more in the modern era, but I really enjoyed this post and how it highlights the avenues such sources offer for future research.